We try to anticipate questions you might have and provide the answers here. If you need additional information please send e-mail to research@ip-6.net. DISCLAIMER: This Web site contains only research information on IP6 and Inositol; the contents are not to be considered as medical advice for which you should consult your physician(s) or other health-care provider(s). IP-6 Research, Inc., does not assume any responsibility whatsoever for your use of this Web site or the information contained herein. Does IP6 reduce calcium, iron, zinc or other minerals? No!This has been a long-held misconception that was based on some not so rigorous studies in the 1950's whereby mineral deficiency in certain populations in Egypt and northern Iran was associated with eating unleavened bread which is rich in IP6. However, these 'studies' did not consider other factors that may have been associated with mineral deficiencies. Subsequent carefully designed studies both in humans and in laboratory animals in different laboratories worldwide have refuted this misconception. More recently, in a study of 412 infants in the Western Highlands of Guatemala, interestingly neither zinc supplementation nor IP6-reduced maize nor their combination enhanced the growth of 6- to 12-month-old Guatemalan infants (Journal of Nutrition 2010) pointing to the fallacy; had dietary IP6 and resultant zinc deficiency been responsible for their stunted growth, the infants should have been cured! One factor that may contribute to the confusion is the chemical state of the molecule. 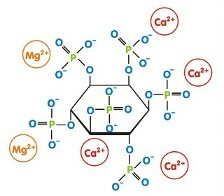 In nature IP6 exists as a salt of Ca++ and Mg++ i.e. calcium-magnesium inositol hexaphosphate (also known as phytin, please see below). However, for experimental purposes, many other different salts of IP6 are available. The negatively charged molecule inositol hexaphosphoric acid (without the cations, also known as phytic acid) which does not exist in nature will of course bind to cations in the test tube. As a matter of fact, a very important mechanism of action of IP6 is it's property as an antioxidant which is mediated by chelating iron as demonstrated in the test-tube. Yet, here is the conundrum: lifetime experiments in rodents and recent human studies have not shown a mineral deficiency following oral administration of IP6 salts even though the ions presumably dissociate in vivo! Quite interestingly however, emerging anecdotal reports in conditions of mineral overload such as hemochromatosis show that Ca-Mg-IP6 reduces the level of serum iron rather dramatically! 2. How safe are Inositol and IP6? Both IP6 (calcium phytate) and inositol are in the list of GRAS (Generally Recognized as Safe) substance by the United States Food and Drug Administration (FDA); GRAS is a designation by the US FDA that a chemical or substance added to food is considered safe by experts. Why combine Inositol with IP6? The scientific premise has been that the addition of inositol to IP6 in a 1:1 molar ratio would yield more of the lower inositol phosphate, IP3 (Ins 1,4,5 P3 is the most active isomer) a key regulator in cell, thereby increasing the efficiency of IP6. Indeed experiments have proven that the combination has resulted in synergistic, most consistent and safe, anticancer, and immune enhancing effect. From the safety + efficacy point of view, while both inositol and IP6 independently show anticancer action, their effects are however variable in different models and species. In some models, IP6-alone though reduced the overall tumor incidence, alarmingly it had increased the size of the tumors in the animals that did not respond to it. The anticancer effect of Inositol in vivo is relatively week (in vitro it does not have anticancer action as it is an essential compound for culturing cells in the lab). 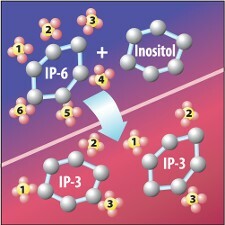 However, when all the various tumor parameters (tumor number, tumor burden, incidence etc) were taken into account, the combination of IP6+Inositol was the safest and the most effective (please consult Table 1 in page 1056 of the original paper in the Journal "Carcinogenesis" 1995 volume 16 and other related papers). Thus, based on the available lab data, for safety and efficacy, human clinical trials must include the combination of IP6 + Inositol and NOT IP6 alone. 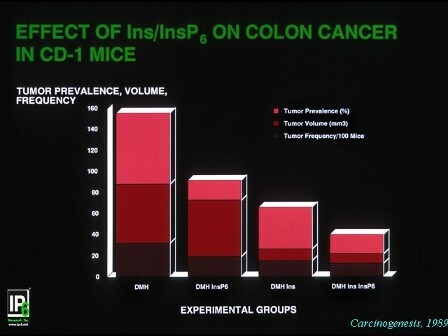 The stack bar graph shows cumulative data on tumor prevalence, tumor volume and tumor frequency in mice treated with IP6 ± Inositol following induction of colon cancer by the chemical DMH. Note that in this model IP6 treatment (second from left) did not change the size of the tumors, whereas inositol did (chocolate colored). Note that when all the 3 parameters are considered together, the combination of IP6 + Inositol yielded the best result, that was statistically significant. 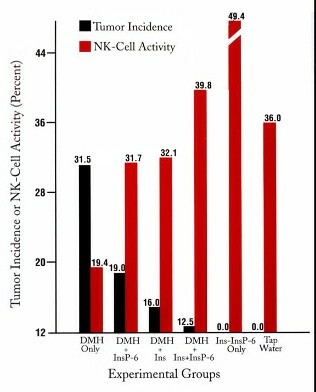 Measurement of NK (natural killer) cell activity in these animals show that the NK activity is reduced in cancer (compare with the tap water control). Both IP6 and Inositol boost NK activity, the results being similar (contrast that with data above). However, the increased NK activity by the combination of IP6 + Inositol in tumor bearing animals is even higher than the tap water control; more spectacular is the marked boosting in normal healthy animals that did not receive the carcinogen. What is the source of IP6 and Inositol? The two main sources of reagent-grade IP6 and Inositol are rice (rice bran) and corn. Most of the nutraceutical-grade compounds are extracted from rice bran. The purity of Inositol is >99.8%; however due to the complex and tedious nature of extraction and purification, hence cost, while the reagent-grade IP6 is about 98% pure, that of nutraceutical grade range from 50-92%. Of course the purer the compound, the more efficient, and even more importantly safe it is; over a certain level of purity the cost becomes exorbitant. Does IP6 and inositol interact with other medicine or food? Inositol is very inert and is not known to have any interaction. 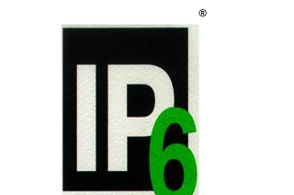 IP6 owing to its chemical structure of having 6 phosphate groups, is suspected to be reactive. However, the naturally occurring IP6 is in the form of calcium-magnesium IP6 whereby the reactive phosphates are unavailable for any strong chemical interaction. Both experimentally and clinically IP6 + Inositol have been found to act synergistically with standard chemotherapeutic drugs. Please go to "What's New" page for details. As to platelets, IP6 causes an inhibition of aggregation of the abnormally sticky platelets, but not of those from normal humans. It appears that "IP6 is about 2-fold more potent than aspirin in inhibiting platelet aggregation." Thus the two have similar action insofar as platelet aggregation is concerned. While IP6 inhibits the abnormal aggregation, therefore useful in preventing atherosclerotic vascular diseases, it also prevents the chemotherapy or radiotherapy-induced reduction in platelet counts. If there are any concerns about bleeding and IP6 use, routine laboratory tests e.g. bleeding time, clotting time etc. are the prudent things to do; and used under the guidance of healthcare professional(s). 6. What do Others such as The American Cancer Society Memorial Sloan-Kettering Cancer Center Natural News.com Nutrition.Org say? You may read the comments by clicking on the organizations' names above.